[INQ. NO. 1510M10] Sungwoo-N Tech ensures the best product quality in hydraulic pipe fitting, hose fitting and other hydraulic areas and accurate delivery of products by utilizing its expertise. Sungwoo-N Tech was also certified in SAE, JIC, DIN, ISO and SPECIAL and strives to meet customer needs. Sungwoo-N Tech assures client companies that its executives and employees will do their best to develop better products and better technologies and to lead the hydraulic area. 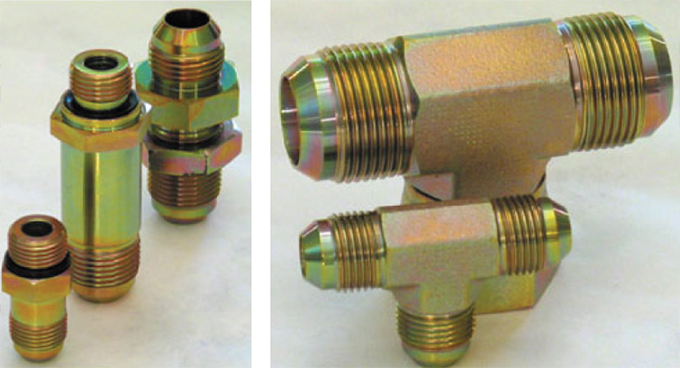 Stainless steel fittings(JIC, SAE, DIN, ISO) can be used at heavy equipment(excavators, forklift truck, etc. ), machinery equipment(CNC, MCT etc. ), farming machinery(tractors, combine, etc.). Now the company’s main product is hydraulic fitting. 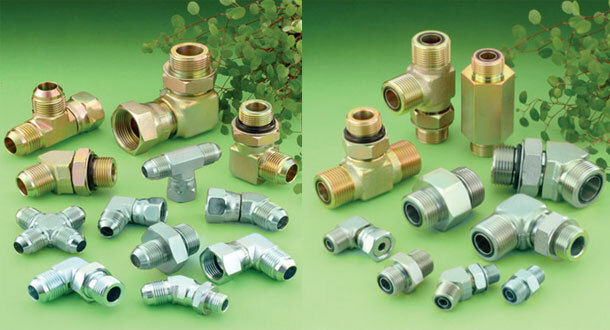 Now there are several kinds of categories – stainless fittings, steel fittings, brass fittings, and pipes. [INQ. NO. 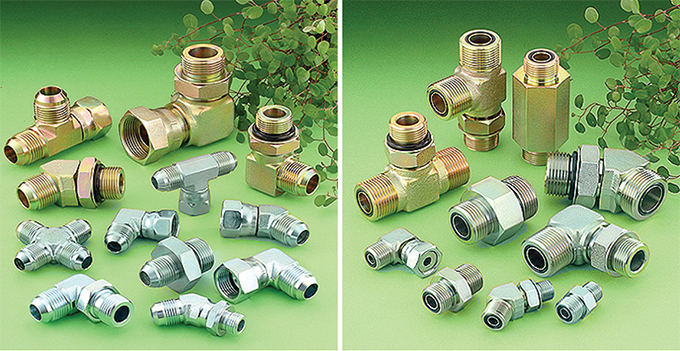 1508M07] Established in 1977, Samwon-Tech is a technology leader in the design and manufacture of hydraulic fittings. Research and development is its top priority to set the standard in the manufacture of hydraulic fittings and hydraulic components. Samwon- Tech is strategically positioned to handle all customers’ global requirements through its ISO-9000, ISO-14000 and TS16949 certification. 37˚ JIC fittings are made for up to 6,000 PSI working pressure in ANSI 1020 to 1025 Materials or SUS316, SUS304 Materials. The forged 90˚ elbows in particular are high standard of finish and cleanliness. 30˚ JIC fitting are manufactured to JIS or safe working pressure up to 420 kgf/cm². Material is ANSI 1020 ~ 1025 carbon steel. There have not been any failures in the field based on this high quality. PIPE fittings are usually made with carbon steel and stainless steel forgings or bar stocks. They are produced to all internationally recognized standards such as ANSI B16.11 BS3799, JIS B2316. As major markets for these products, Europe, Japan, and the United States, are emerging with market potentiality. Filed Under: Machinery Tagged With: carbon steel and stainless steel forgings, Hydraulic Fittings, PIPE fittings, Samwon Tech Co. Ltd. Established in 1977, Samwon-Tech is a technology leader in the design and manufacture of hydraulic fittings. Research and development is its top priority to set the standard in the manufacture of hydraulic fittings and hydraulic components. Samwon-Tech is strategically positioned to handle all customers’ global requirements through its ISO- 9000, ISO-14000 and TS16949 certification. 37º JIC fittings are made for up to 6,000 PSI working pressure in ANSI 1020 to 1025 Materials or SUS316, SUS304 Materials. The forged 90º elbows in particular are high standard of finish and cleanliness. 30º JIC fitting are manufactured to JIS or safe working pressure up to 420 kgf/cm2. Material is ANSI 1020 ~ 1025 carbon steel. There have not been any failures in the field based on this high quality. Filed Under: World Class Tagged With: Hydraulic Fittings, PIPE fittings, Samwon Tech Co. Ltd. Established in 1977, Samwon-Tech is a technology leader in the design and manufacture of hydraulic fittings. Research and development is its number one priority to set the standard in the manufacture of hydraulic fittings and hydraulic components. Samwon-Tech is strategically positioned to handle all customers’ global requirements through its ISO-9000, ISO-14000 and TS16949 certification. 37º JIC fittings are made for up to 6,000 PSI working pressure in ANSI 1020 to 1025 Materials or SUS316, SUS304 Materials. The forged 90º Elbows in particular are high standard of finish and cleanliness. 30º JIC fitting are manufactured to JIS or safe working pressure up to 420 kgf/cm2. Material is ANSI 1020 ~ 1025 Carbon Steel. There have not been any failures in the field on this high quality. PIPE fittings are usually made with carbon steel and stainless steel forgings or bar stocks. They are produced to all internationally recognized standards such as ANSI B16.11 BS3799, JIS B2316. As major markets for these products, Europe, Japan, and the USA, are emerging with market potentiality. Samwon Tech is a technology leader in the design and manufacture of hydraulic fittings in Korea. Research and development is its number one priority to set the standard in the manufacture of hydraulic fittings and hydraulic components. Also it is a global manufacturing and design company with state of the art facilities located throughout the world. Currently, the company has strategically positioned itself to handle all its customers’ global requirements through its ISO-9000, ISO-14000 and TS16949 certification. It exceeds all global quality and environmental standards to bring the finest quality products to its customers. Hydraulic fitting is the part to connect pipe, hose, or internal combustion engine in hydraulic machines, devices, etc. It is combined with ends of the pipelines or hoses to flow hydraulic fluid. 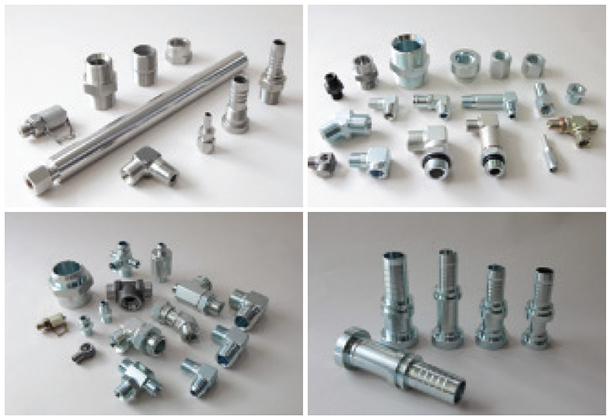 Samwon Tech mainly has produced hydraulic fittings for high pressure which is used in heavy construction equipment (ex. excavators, backhoe, loaders, cranes), industrial vehicles (ex. forklift truck, dump trucks), military equipment (ex. armored vehicles, tanks), agricultural machinery, etc. Hydraulic fittings can be classified according to its shape or raw material. There are Straight type, Elbow type, Tee type (T-shaped), Cross type (cross-shaped), etc. 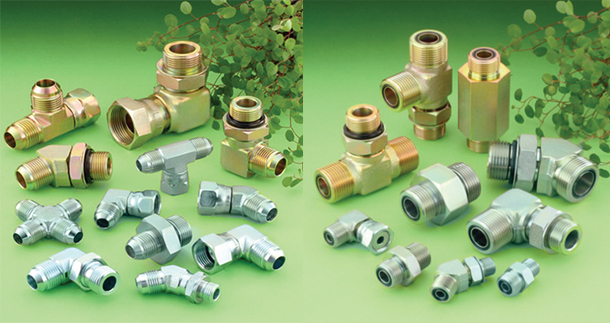 by shape and the material of carbon steel or stainless steel fittings, brass fittings, etc. Filed Under: KOTRA Tagged With: brass, Hydraulic Fittings, industrial vehicles, Samwon Tech Co. Ltd.